in low, Hart was forced to jump. "I remember looking up to see if my chute had opened and looking down and seeing a tree," Hart said. As he had been trained, Hart cut himself free from his parachute and harness and jump[ed] from the tree. "When I looked up in the sky, it was like some kind of fantasy world with all the planes and the lights of the tracers." After Normandy, Hart and his company jumped on several other missions. Hart's last mission would be the Battle of the Bulge in Belgium. 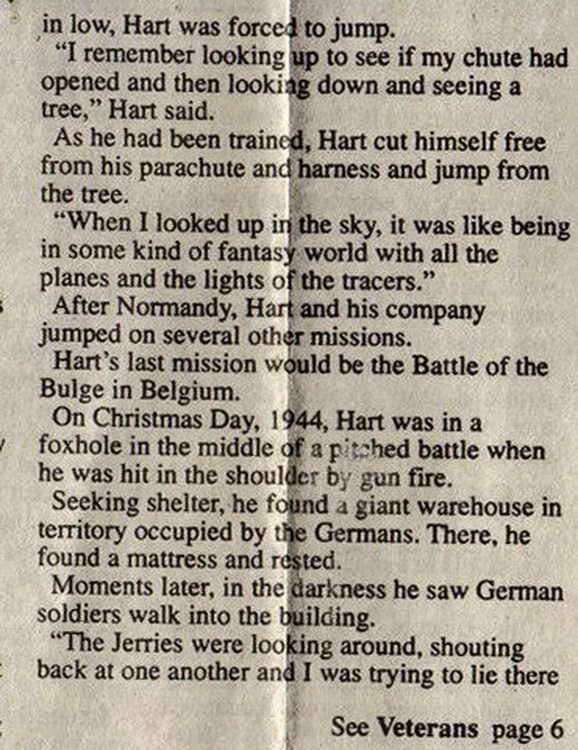 On Christmas Day, 1944, Hart was in a foxhole in the middle of a pitched battle when he was hit in the shoulder by gun fire. Seeking shelter he found a giant warehouse in territory occupied by the Germans. There he found a mattress and rested. Moments later, in the darkness, he saw German soldiers walk into the building.